Motorola has surprisingly launched a new tool which they have designed to help users unlock certain Motorola devices, such as the Photon Q, RAZR developer edition, XOOM (Verizon) and XOOM WiFi. Motorola hopes to expand on this list of devices very soon and has created a new “Unlock My Device” web page, which allows users to unlock their devices bootloaders and install third-party software. 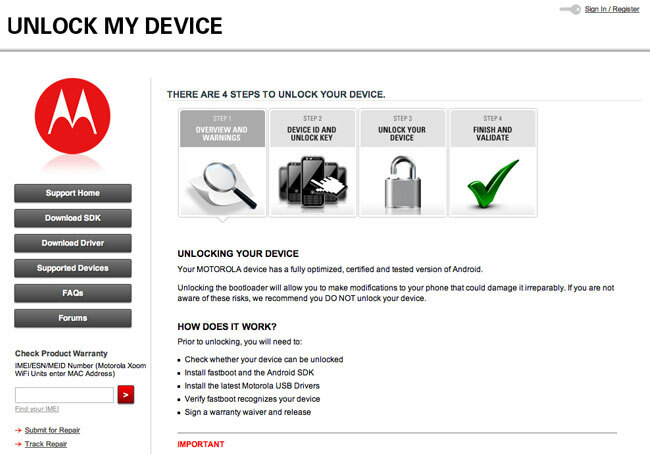 On the new Unlock My Device page Motorola makes clear the consequences of unlocking your devices, but guides you through the process and what you need to do to pre-pare your devices for unlocking, and what to do to make the unlock function. For more information on the new boot loader unlocking tool jump over to the Motorola website.